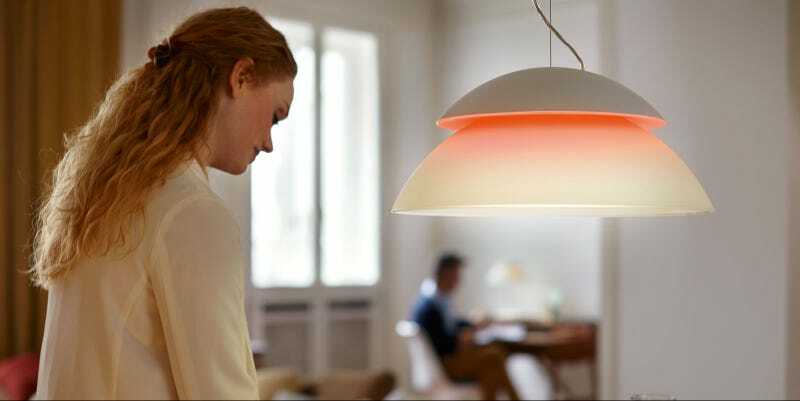 While the Hue lights from Philips are capable of producing more than 16 million shades of colored light, flipping between functional white light and playful colored light can be a bit of a pain. And while the native app's scene selections feature can help to partially alleviate this issue, Philips has just unveiled another option: two bulbs, one fixture. Dubbed the Philips Hue Beyond, this dual function light incorporates a pair of bulbs—one as an uplight, the other facing downwards—both of which are controlled independently via the native app. This may initially seem a bit redundant—I mean, why blow your hard-earned cash on an entirely new light fixture when you can just as easily swap between light palettes using the Hue Tap—but that's only if you plan on using a single light source for multiple functions.